Of all the chocolate cakes I have made - and I have made quite a few - this is our favourite chocolate cake. Which is why I am quite surprised that I haven't posted this one before! But wait, there is a good reason for it - you see, I've never been able to click any pictures for this cake. No one has the patience for pictures to be clicked. The moment the frosting is on the cake, it has to be cut and eaten. Does this give you an idea of how good this cake is?! Yes, this cake is really that good. Even if I have to say it myself. So good that even you would want to lick your fingers and the plate long after the last crumb is devoured. Very very chocolately, soft and moist....what more could you possibly want from a chocolate cake? Perfect entry, I think, for the 'Best Chocolate Cake' event hosted by Divya! Edited to add...My apologies to all who land on this page and don't find a recipe. Please email me for the recipe. Wow!!!! I am also drooling over here!!! Will definitely making this soon...Bookmarked! Drool worthy no wonder none gives u time to click! That looks excellent! Would surely try it soon. I don't get self raising flour here. So what do it replace it with??? I can eat chocolate cake even after I am totally full, that's how much I like it. I am still learning to bake, so it will take time to get to your stage. But, I have a question, I do not need eggs and I know people substitute it with milk. Do you have any idea about the measurements? Perfect,moist n a chocolaty yummy yum cake.Iam getting way much irresistible.Glad that your daughter like it,nice way of portraying it :) Really a gorgeous cake. I call it the king of cakes. simply love it and now you have got me drooling here with this ravishing picture. perfect. Gorgeous Gorgeous Cake!! I looks so moist and rich. wish I can have a piece of it. Wow does that look sinfully decadent or what?! On my list of thinks to bake! Thanks. Awesome cake, looks absolutely divine.. Awesome!! Awesome!! nice pics..looks so yummy!!! Superb and yummy cake! I've got the same plates as you have shown in the pics! I immediate bookmark this recipe, and try it out soon, my family love chocolate cake. TEMPTING!! 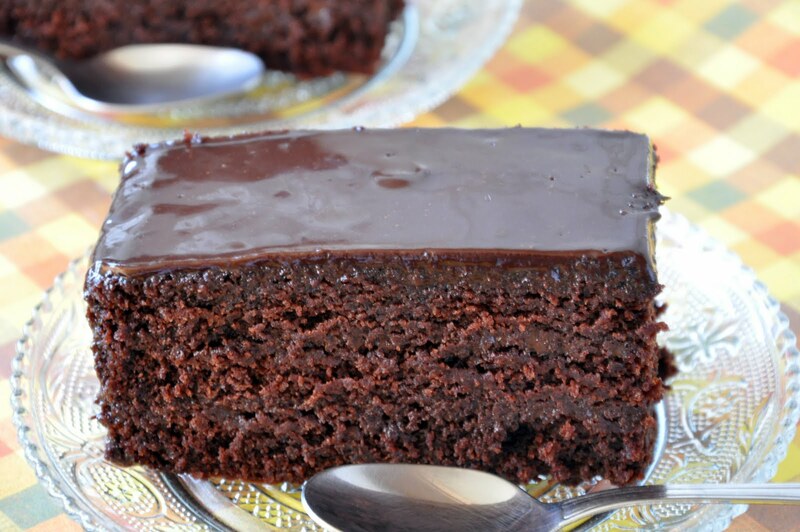 Seriously..I am drooling over that pic..Love the chocolatey goodness anytime of the day..God,I have so many recipes to try,including your Fudge Cake..:):).BOOKMARKED!! I would lick like that too, just so so super super yumm. Awesome, awesome.. am still drooling and dreaming about that choc fudge cake and now this!! wow!! Bookmarked! It looks really v good. Like the clarity in the last picture, the texture really shows up. What gorgeous pics! Cake looks divine! Any substitute for blackberry or blueberry jam? We dont find these jam's so easily in india..hence asked. Thank you ladies, do let me know how it turns out when you make it. Nithya, just add 2 tsps of baking powder to 250 gms of plain flour. Never done this before but hope it works for you. Priya, I have never substituted eggs with milk but Google says 250 ml milk for every egg. Parita, I am guessing strawberry jam (seedless) should be perfect. The original recipe called for blackberry, I used blueberry and it was perfect, so I guess so would strawberry, or for that matter any seedless berry jam. Have you sent this entry to my mail yet?? Ooohhh, I love how PERFECT your frosting looks. I made a truffle cake too for my birthday last year, and was perplexed as to what the "truffle" part meant (thinking truffles as in mushrooms) until Simran of Bombay Foodie set me straight. The jam is an interesting touch! This looks incredible......mmmmm I love chocolate cake!! I don't blame her! I love a good chocolate cake, but hardly ever bother with new recipes because they're all somewhat me too. I have never seen a choc cake recipe with jam in it. Can you taste the jam? I've got to try this! Dee, no, you can't taste the jam at all! SM, curry Leaf, actually I was quite kicked seeing her do that! Aparna, Chef Dennis, Pierre, thanks for visiting and your lovely comments. Looks so good! 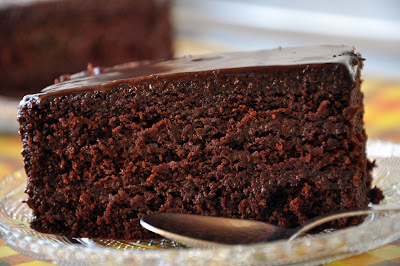 This is one of those chocolate cakes that I just HAVE to make. Love the pic of your child! Hi liha, I have never used veg oil for this cake, but here's what you could do: beat the sugar and eggs firts till light and fluffy and tripled in volume. Then with the beaters still running, pour in the oil in a thin stream into the beaten eggs. Beat till properly combined and proceed with the recipe.